I have previously described the path as going beyond conditioning, I have also described it as the path of compassion, insight and creativity. It is not narratives we need to understand, follow the path. So far I have looked at narratives and have seen that the manipulators of the 1% can condition based on any narrative. A narrative is a set of ideas describing a situation. Finding a new narrative is not a revolutionary act because it is simply a set of ideas – khandhas. What matters is the power. For conditioning of the narrative to happen there needs to be power, and that power provides an object of desire. People desire that object, maybe money from a job, they become addicted to that desire – because of what the money can buy, and we have the conditioning that can be recognised in any description of paticcasamuppada or the 4 Noble Truths. Addiction – desire and craving – is at the basis of this Buddhist dogma, I am simply describing how this conditioning is developed in daily life. But it is the same dogma, the same description, the same process; addiction . In this addiction blog, I have gone into detail with addiction and how it can be understood in terms of the two Buddhist dogmas paticcasamuppada and 4 Noble Truths. Overcoming addiction is not easy but it can be done, but the first step is to recognise there is a problem. In this same blog I discussed addiction to self, few would see this as a problem, but that is the nature of addiction and the first step is recognising we are addicted to self. Now body and psyche refer to the khandas. 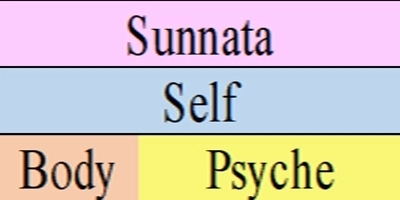 Body – rupa, and psyche – feelings (vedana), perceptions (sanna) and mental constructs (sankhara); with consciousness (vinnana – also a khandha) these are the basis of human ontology. Events can fit into these categories. Conditioning is a natural process. An event happens and consciousness attaches to it. Babies like (desire) suckling and enjoying mother’s milk. Adults like (desire) having money to buy a house. Conditioning is not a process that is inherently evil, it is natural. But when we are considering narratives, there is a process that is human – how the powerful give their power to the narrative. This is a function of the desire of the powerful. This power is nature’s power but it has accumulated through wealth to a few, and they decide when to give power to the narrative. It is relatively easy to understand addiction because we know of and have seen many examples of addiction to substances. But we do not understand addiction to self. In part this is because we do not understand the formation of self. And this comes back to the khandhas again. As we like different events, that like becomes part of who we are. As a baby we like suckling, we desire suckling, we cling to the mother’s breast. At that time suckling mother’s milk has become who we are – as a baby we selfishly want mother’s milk. Then the power, mother, says enough is enough, and no more self. We don’t question this analysis of self, but we don’t recognise that this process of desire-clinging-becoming self is the natural process that applies to all events. And more importantly we don’t realise that we can be weaned off this addiction to self. Babies don’t choose to dump the breast, power decides for her/him. When we consider the human self of the adult, where is the power that decides? Consciousness. Consciousness can decide to form self or break away from self. But that consciousness is not “on its own”. Always sunnata is with us, always the path is with us, but if our consciousness is always stuck in the body and psyche then we just continue to create self – we are addicted to self. The word for consciousness not being stuck in body and psyche is awareness. Somehow consciousness recognises that it does not have to stay attached to the body and psyche, attached to self, and it starts to follow the path. We could visualise that awareness is when consciousness becomes attached to sunnata but that visualisation is confusing if we take it literally as that sort of attachment can never exist. It is much better to talk of this as following the path, the path of compassion, insight and creativity, and as it is a path that is not addicted to self it is a path that is beyond conditioning. Let us consider the new narrative again. Naomi describes the situation at the moment as having a potent vacuum, as an indigenous activist I accept her judgement – with my age and where I live I cannot judge. The essential word here is potent meaning power, and power governs ideas. I surmise that the need for a new narrative is being driven by the realisation that automation will drastically reduce employment thus ending the essential of consumerism – the consumer. The zombie idealism of the current consumerism will continue to lurch for as long as it can because the accumulators will not relinquish power. What will replace it will be some compromise that will enable their continued accumulation – they have more invested in there not being an apocalypse than most people. Hopeful people, Naomi, want a new narrative but with narratives having no power in themselves such narratives will simply be the “same old same old” conditioning as they have been since tribal times. The powerful want a narrative that allows them to continue accumulation. They will then give power to this narrative, conditioning will follow, and “same old same old”. If a new narrative can give them the same accumulation their desire would be happy, and they would give power to the narrative. Is there such a narrative? But remember narrative is a khandha – sankhara. We attach to a set of ideals, it becomes part of self and we become addicted to it. As an activist, of course you must engage with the process of changing the narrative in the hopes of participation enabling a better narrative. But narrative is part of the addiction, narratives create the conditions, the process is conditioned, and the conclusion will be conditioned. Because of addiction that is how we all, including the powerful fit, into the narrative. For people the real hope lies in going beyond conditioning, following the path. Following the path does not mean the end of making better changes of the narrative, but it gives greater power, it gives resolve, it gives strength and conviction, and it avoids the attachment and disappointment of windmills. It is pleasing to see Naomi as an indigenous activist talking of oneness, similarly with Russell, but the best thing for progression in all human movement is the path that includes recognition of oneness. Naomi you have grasped this because you describe indigenous movements as being driven by love – indigenous love of the land. This love of oneness is being sunnata, it is Gaia, and indigenous culture is much closer than the miseducated “European” culture. But love is not restricted to indigenous movements, love is the path. Despite the potential “hippy” labelling the best way forward in terms of the narrative is not to promote a new narrative but to promote following the path. This is not some loose airy-fairy impractical naval introspection because it is the path that goes beyond conditioning. However the narrative is resolved, following the path will enable people to deal with the conditioning that results from any new narrative. There is talk of revolution. In Marxist terms revolution means change of ruling class from bourgeoisie to proletariat, in non-Marxist terms revolution can just mean a change of government created by violence. Violence is not the answer. We live in a world that is controlled by violence. The powerful have not only accumulated money, their power also means control of violence through the military, even more so with the privatisation of security. To seek revolution through violence is now self-defeating and akin to suicide of ordinary people by the oppressive violence (cf suicide by cop). Do not seek suicide by the powerful, there is no future for anyone there. The revolutionary path is to go beyond conditioning. If you don’t accept the conditions they offer, what can they do. If they take away your house you go somewhere else you still have your path. When your path gives you strength in adversity people will see, and then they will see that the path s what they must follow. The path itself is revolution, and is not violent. A political maxim:- detach from desire and follow the path.